The Bradford WW1 Group meets on the 4th Wednesday morning of each month, from 10.00am to 12 noon.. We are a convivial group and you will be made very welcome indeed. Our programme of speakers covers a wide variety of topics and, twice a year, we hold ‘Bring and Tell’ sessions where a range of interesting and often unexpected artefacts are discussed! Just 18 when the German Revolution broke out in 1918, Hilde Kramer was immediately at the centre of events and one of the few women delegates of the International Communists in Moscow in December 1918. Arrest, imprisonment ans exile followed. Her son Desmond was to become Professor of Chemistry at Leeds University. Hilde lived with him in Ilkley from 1971 – 1974 and died in hospital in Otley. One of the long lasting effects of WW1 was the high number of casualties caused by modern industrial warfare. The Ministry of Pensions in 1916 and the mobilisation of a range of charitable organisations provided medical and financial support but much of the day to day care for disabled ex servicemen devolved to their families, particularly women. Shortly after the war ended, the Burnley Express published a list (incomplete) of the 4000 men who had died, describing it as “a heavier drain on it’s manpower than most places”. The loss was, proportionally, one of the highest in the country. Towneley Hall has collected artefacts ans stories “behind every name there was a person, behind every person was a story”. We will see and handle some of the artefacts which have come to light as the town remembers. Bradford has the only museum in the country dedicated to the history of peace. The museum’s current exhibition examines whether the post – war peace was flawed. A small village in Wharfedale has commemorated WW1 with a succession of events, activities and publications as well as two battlefield trips to the graves of local men. Members of their small committee will share with us some of the remarkable stories and memories uncovered and retold as a lasting village tribute. 25 September Dave O’Mara: ‘La compagnie Armericaine’ and other foreigners in the service of France. Even though America did not officially enter the war until April 1917, from the beginning many young men decided to volunteer to serve alongside French troops. Were they hoping to repay the debt to Lafayette and Rochambeau who helped the 13 colonies win the American Revolution or, as the poet Alan Seeger suggested, did it provide “that rare privilege of dying well” ? Seeger died on 4th July 1916 when serving with the French Foreign Legion. 23 October Carl Watts: Hostile Environment: Britain in Russia 1918 – 1919 Carl is on the staff of the Green Howards Museum and will tell the little known story of how 1300 men of the regiment played their part in the Russian Civil War. Personal archives from the museum’s collection help explore the complex positioning of ‘red’ versus ‘white’ at a time of global social and political upheaval in the aftermath of WW1. The fourth Wednesday morning of each month is the time for meetings of the World War 1 Group. We begin with coffee and biscuits at 10.00 and the convivial, welcoming atmosphere continues into the business agenda at 10.30 and lively discussion following a visiting speaker. The meeting ends at 12 noon. Whilst members have particular enthusiasm for the role which Bradford and its citizens played, they also share an interest in all aspects of the Great War. This is reflected in the extremely wide range of topics covered by our programme of speakers. 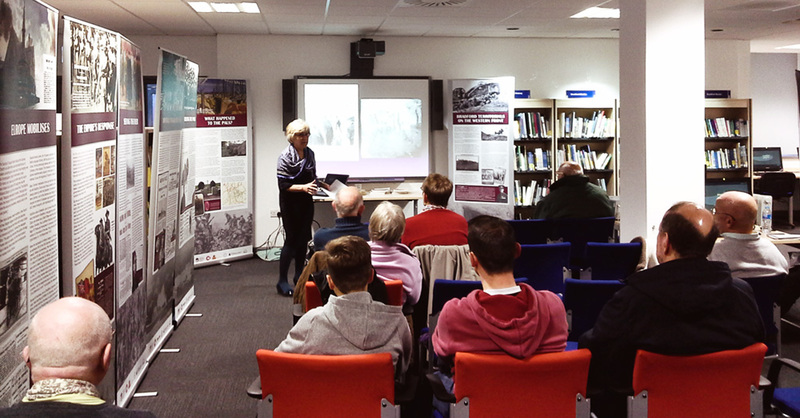 Our Heritage Lottery award provided us with a digital projector, speakers, screen and several laptops for research. In December 2016 the WW1 Group received the papers, photograph albums and research notes of local researcher PD Lodge. This valuable archive can be made available for study. We also have a display cabinet of donated artefacts. The exhibition display panels researched and written by members of the WW1 group were produced by Inchpunch Design and form part of our Heritage Lottery Project. 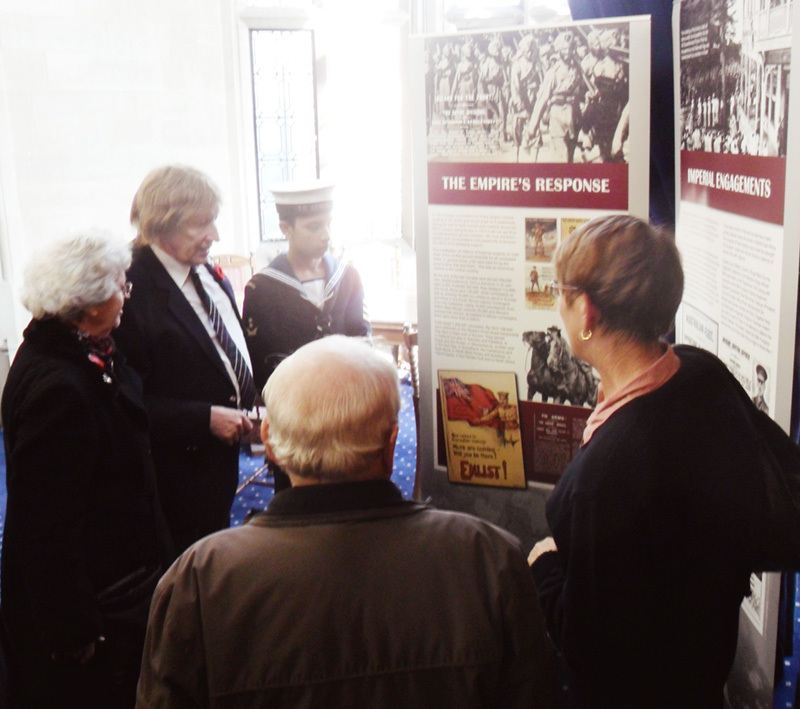 They have been exhibited twice in the banqueting suite of Bradford City Hall at the invitation of the Lord Mayor’s office; at Bradford Central Library during the presentation about the war poet Humbert Wolfe; at events held in the meeting rooms of the Mechanics Institute and as a back-drop to presentations given by group members in other locations, including the Ilkley Literature Festival in October 2014, at the Bradford Club on 25 February 2015 and on Sam Meekosha Day at the Local Studies Library on 19 November 2015. 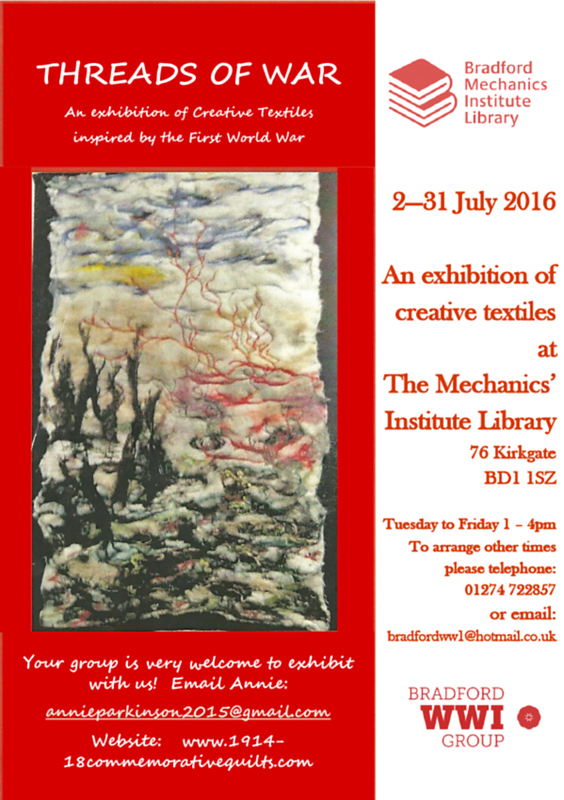 Throughout July 2016 the WW1 Group staged an exhibition in the Mechanics’ Institute Library entitled ‘Threads of War’. Opened by the Lord Mayor on Saturday 2 July, the display comprised creative textiles in a range of styles reflecting aspects of the Great War. The exhibition was curated by Annie Parkinson of the East Riding Commemorative Quilts Group. 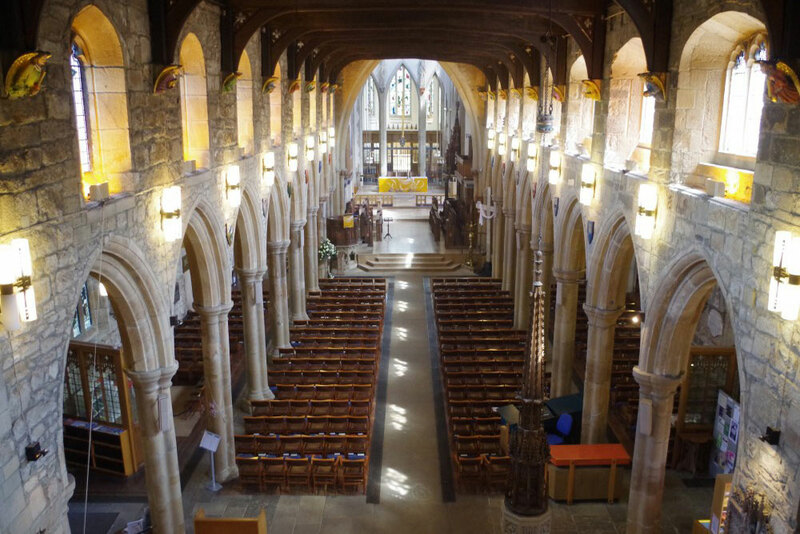 At the invitation of Bradford Cathedral the exhibition will be on display in the Cathedral for the whole of July 2016 and will form the backdrop for the Civic Commemoration of the Battle of the Somme to be held at the Cathedral on Saturday 9th July 2016 at 3pm.